Mice placed on a low-calorie diet are less likely to develop abdominal aortic aneurysms, according to a new study in The Journal of Experimental Medicine. The paper, “Calorie restriction protects against experimental abdominal aortic aneurysms in mice,” which will be published online September 26 ahead of issue, suggests new ways to prevent the often fatal condition from occurring in humans. 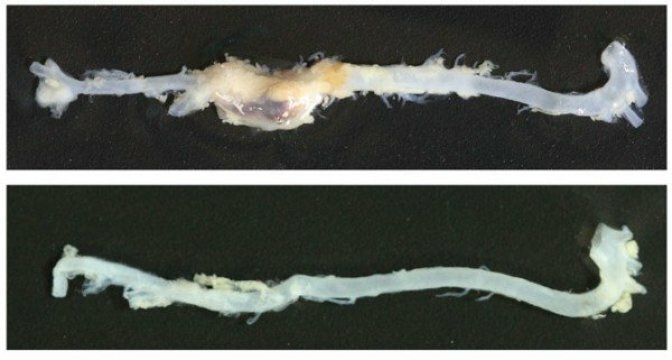 The aorta of a mouse fed a normal diet shows a large aneurysm (top), whereas an aorta from a mouse fed a calorie-restricted diet shows no abnormal dilations (bottom). Abdominal aortic aneurysm (AAA) is a localized enlargement of the main artery in the abdomen caused by a weakening of the blood vessel wall. With over three million cases per year in the US, preventing the development of AAA is crucial because, if the aneurysm bursts, the mortality rate can be as high as 80%. The risk of developing AAA increases with age and can be exacerbated by other factors such as smoking. A team of researchers led by Hou-Zao Chen and De-Pei Liu, from the Chinese Academy of Medical Sciences and Peking Union Medical College, wondered whether the risk of AAA might be reduced by a calorie-restricted diet. Calorie restriction has been shown to have a variety of health benefits in mice and humans due to its far-reaching effects on the body’s metabolism. The researchers placed mice prone to developing AAA on a calorie-restricted diet for 12 weeks and found that the animals were less likely to develop aneurysms than control mice fed a normal diet. The calorie-restricted mice also showed lower rates of AAA rupture and death. The researchers determined that calorie restriction reduced the levels of an enzyme called MMP2 that degrades the protein matrix surrounding blood vessels. This was because, after 12 weeks of reduced calorie intake, vascular smooth muscle cells in the wall of the aorta up-regulated a metabolic sensor protein called SIRT1, which can epigenetically suppress multiple genes, including MMP2. The researchers found that calorie restriction was unable to reduce MMP2 expression and the incidence of AAA in mice whose vascular smooth muscle cells lack SIRT1. The study suggests that reducing calorie intake can protect mice from AAA by up-regulating SIRT1. “Our findings support the benefit of a calorie-restricted lifestyle for AAA prevention in humans, and suggest that SIRT1 could be a promising molecular target for the treatment of AAA,” says De-Pei Liu.